Royal Trumpet Mushrooms are very meaty and are used by many Vegans and Vegetarians as a meat substitute. Kings are mild in flavor and are great sauteed by them self, grilled or added to soups, stews, stir frys and many other dishes. 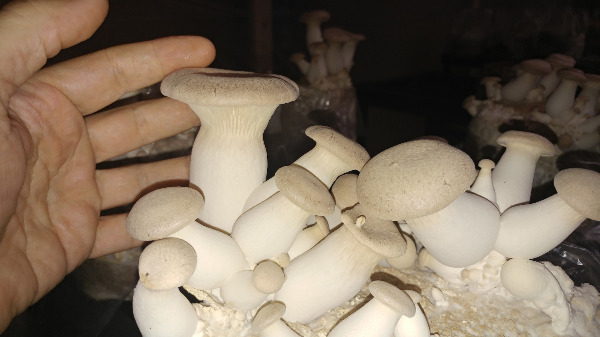 Our mushrooms are grown indoors so there is no need for pesticides or chemicals. We use a 100% organic process during the growing of all our mushrooms. Your order will only include the edible parts. No stem or spines. Q: I purchased several types of your mushrooms today. Can you tell me the best way to store them? I am using the in a soup that I will not make until the weekend. A: They will store in the fridge for at least a week, sometimes two weeks. If condensation collects on the lid just wipe it off with a paper towel.